Day 7 in Costa Rica – Volcanoes, Iguanas, and Pumas! Oh My! After a quick breakfast at the La Fortuna Hotel in downtown Fortuna, we loaded the bus yet again for another adventurous day in the beautiful country of Costa Rica. 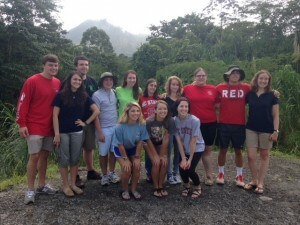 We knew our day would consist of a four-hour drive through the Arenal Volcano area. Our first stop was at a scenic spot about 15 minutes down a bumpy road. No matter how rough the ride was to get there, this spot was worth it. We stopped at an area where a bridge suspended over a raging river with the volcano situated upstream making for a great photo opportunity. The Arenal Volcano is considered active but has not erupted in a while. We were able to see the landscape of the volcano while driving down the road. It has forage growing on part of it and molten rock where lava has been before in other areas. The next stop included a small coffee shop located at a breathtaking view of Lake Arenal. Everyone enjoyed the baked goods and coffee drinks that the café offered. Next, we continued on our journey leaving the volcano and lake behind us. We arrived in Canas right after lunchtime and ate at a white water rafting center. This being said, we sat by the Cocobici River while eating. Some members of our troupe were excited to see an iguana resting on a tree branch nearby. After lunch, we arrived at the Las Puma Reserve just outside of town. There, we rushed over to the jaguar enclosure before he finished eating his lunch. We also saw a peccary, an indigenous wild pig. Many of the animals at the reserve have been rescued from subpar circumstances. The magnificent animals that we observed included a three-legged Whitetail deer named Bambina and many birds like toucans and macaws with missing feathers. We also saw Capuchin and Howler monkeys, ocelots, jaguarandi (a small jaguar-like feline), and the ever so mysterious pumas. It was neat to see an animal park such as this one with native animals that we might not get to see back home in the United States. We then checked into our hotel and rested a bit before eating a typical dinner of beef, chicken, or fish (Tilapia) which also came with the always expected rice and beans.